The royal wedding seems to be creating more questions than answers at this point -- Who is the maid of honor? What will the cake look like? But arguably one of the most important questions: What will Meghan Markle be wearing on May 19? We may not know yet which designer or design she'll be wearing, but if she follows family tradition, she'll be in white -- despite the fact that she's been married before. According to In Style, before the 19th century, brides wore many colors on their wedding day, but red was reportedly most popular because it symbolized fertility. It has also been viewed as a color that symbolizes joy and luck. In the United States, some brides wore red during the Revolutionary War to symbolize the independence Colonists desired. However, in 1840, Prince Harry's ancestor, Queen Victoria, made a fashion statement that has forever caused her to be recognized as popularizing the tradition of a bride wearing white on her wedding day. At the time Queen Victoria, then 20, married Prince Albert, red was still the color of choice for wedding dresses, so she royally shocked everyone when she showed up on a procession of carriages at the Royal Chapel of St. James' Palace wearing a white satin dress trimmed in lace and adorned with orange blossoms, toting a lace veil. It's worth noting, too, that instead of wearing a crown, she wore an orange blossom wreath. 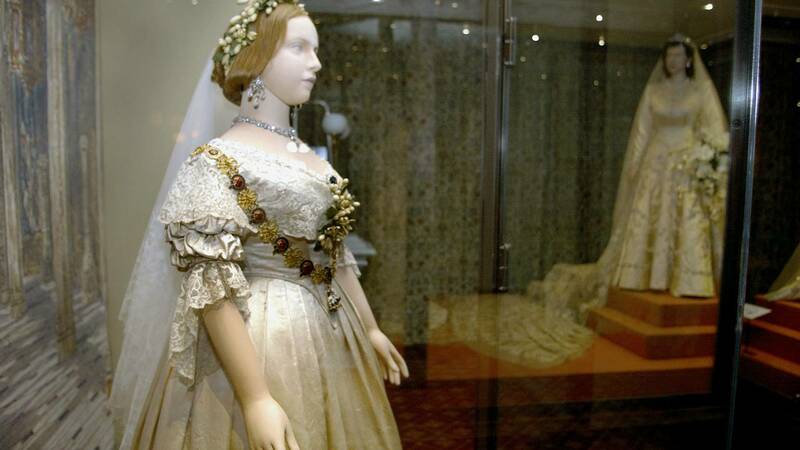 A mannequin of Britain's Queen Victoria, wearing her wedding dress, stands in front of a model of Queen Elizabeth at Kensington Palace. (Photo by Sion Touhig/Getty Images) CLICK TO OPEN FULL IMAGE. And so a tradition began that we still follow today. Biographer Julia Baird said Victoria, being the star of the "show," requested no one else wear white to the wedding, aside from her bridesmaids. The lace pattern used on Victoria's dress was apparently destroyed after the job was done so that it couldn't be copied, according to Vanity Fair. The queen was also known to have recycled her wedding attire in later years, wearing her lace veil for several special occasions that included christenings, portraits and weddings. She also chose to be buried in white, wearing her wedding veil in lieu of any monarchical regalia. The queen's decision to wear white on her wedding day made world news through newspaper reports, paintings of the ceremony and souvenir artwork. Regardless of what fashion Markle chooses to go with on May 19, she will undoubtedly make world news, too. Until then, we will be patiently waiting to see what (beautiful gown) she shows up in at St. George's Chapel.